It was very strangely easy to break out of the kennels. Mhumhi had thought, at any moment, that they would be accosted by the guards, dragged back to their cells- even kind-hearted Nzui could not stay so sweet in the face of this sort of rebellion. But it was as Bii had said: as they walked through the noisy facility, no painted dogs showed their faces at all. He was half-expecting another trick from Bii, too- trying to at least pretend he had got wise. But the fox seemed earnest enough, though he kept close to his companion the maned wolf. Perhaps he thought it would protect him if anything was awry- Kutta was giving him a rather intense yellow-eyed stare. Mhumhi doubted the wolf would be much of an ally, though, as it kept cringing away from the barking domestics and the wailing hulkers and them. It looked like it would bolt at the first opportunity. Mhumhi had walked with his share of peculiar groups at this point, but it seemed there was always a new one around the corner: now it was the bat-eared fox and the maned wolf, then he, Kutta, and Vimbo, still looking leery. And finally, the little domestic named Mini. She was trotting briskly beside him, her mouth open to let her little pink tongue hang out as she panted. She had been able to slip out of her run without trouble after all- her cagemates seemed especially reluctant to come out once Vimbo had been freed. Mhumhi had to wonder at his own easy acceptance of her. Kutta’s, too. Perhaps it was the puppyish look of her; it simply seemed incomprehensible that she could prove to be a threat. Mhumhi did stop the group before they had gone too far, as he smelled something- someone. Perhaps it was morbid curiosity that drove him. “I’ll be right back,” he told the others, and stole down one of the rows of caged hulkers. They all looked at him with their whitened eyes, clinging to the chain-link with their thin fingers. They must have seen him as just another police dog, stalking the rows, he thought. Perhaps even that he would be the one to decide who went next to Big Park… The thought made him swallow. He had no idea how such an awful selection process would be carried out. He halted in front of one cage, where a lone female hulker sat in the corner, clasping herself with her arms and rocking gently. She paused in her rocking, then turned and looked at him. Her eyes, now sunken in hollows, bore none of the sharp malice he had once seen in her. She turned her torso, still gripping herself, and let her eyes linger on him for a moment. He was suddenly rather struck by her nakedness, as he had only seen her clothed before, and uncomfortable. It seemed… he did not know how to explain it. Mhumhi gave a neutral grunt, staring somewhere at the wall behind her head. Now he realized that it would be slightly foolish to even ask, because she had been slightly mad even before she had come to this place, and probably a liar, and she had no reason to help him now. “What’s your question?” asked Lamya. Her fingers ghosted across the bare skin on her waist. He recalled the cord she had once put there, and swallowed. Lamya paused, eyes going a bit vague for a moment. Mhumhi kept silent, because he did not really see anything insulting about the question, and Lamya wavered a bit on her ankles, her wrinkled brown knees nearly touching the floor. “One hundred and ninety-one?” Mhumhi blurted out. She seemed to be meandering a bit, smacking her lips. Mhumhi shook himself a little and tried to draw her back on-topic. Her inflection seemed odd. Mhumhi pressed on. She broke off here, and Mhumhi heard the clicking of nails on concrete. Kutta was walking over to him, looking worriedly from side to side. “Nothing,” said Mhumhi, putting his ears back. Lamya had shifted to press herself back into the corner of her run again, chewing her lip. “Right,” said Mhumhi, though the words made him a bit uneasy contrasted with what Lamya had just been saying. He half-wanted to say goodbye to her, which was very strange, because all things considered she was very unpleasant and had in fact threatened to eat him. And he could not forget that it had been her snare that had caught around his leg on the day that Sacha had been killed. But here she was, her fangs removed, and he knew she would die a most wretched and painful death. And she knew. What could he say to that? Perhaps it should have made him happy. It did not. He followed Kutta back to the group without saying another word. “I’ve left it open a crack,” said the maned wolf, skulking a few feet away. “Don’t anybody be stupid and pull it the wrong way, or we’ll be trapped and rip- ripped apart-” He shuddered and gave a little whine. “I can sprint over and push it open!” piped up Mini, wagging her rump. “Hm,” said Kutta, catching Mhumhi’s eye, but neither of them said anything. “Then we should not wait,” said Bii, shaking himself. “Once they’ve organized themselves again, they’ll be trying to track you down. If you can get far enough away from this place, though, they may be forced to turn back and return to their posts. There aren’t many painted dogs loose in the city right now.” He grinned. “He will be glad,” said Bii, in a somewhat clipped way. They spoke no more and instead crept through the furthest row together, suddenly aware of the real urgency of the situation. Mhumhi trembled a bit at the thought that they would have to pass through the line of sight of the guards. Perhaps they seemed lazy and feckless, but there must have been ten of them at least. And he knew what so many painted dogs could do. Bii stopped them at the end of the row, raising his tail, and then crawled forward on his elbows to peer around the last kennel. Bii gave a tiny squeak. The hulker in the cage behind him had reached its fingers through the chain-link to wrap them around his tail. 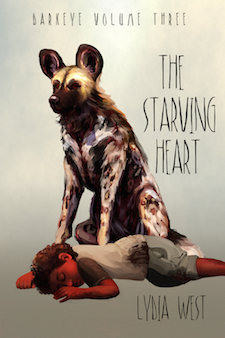 Mhumhi lunged at it and the hulker withdrew, releasing Bii, but he could tell that the damage was done from how wide Bii’s eyes were, and from the sound of faint chattering; painted dogs being roused. Bii’s puffed-up tail whirled in a circle and he suddenly dashed in the opposite direction at full speed, back down the row. Mhumhi froze, but Kutta sprang after him, and Vimbo after her. Mini gave an excited yap and tore after the pair of them. The maned wolf quivered and cringed in place and did not move. Mhumhi did not see what else he could do but follow his sister, so he did, leaving the poor maned wolf quivering by himself. They had already reached the row, but his long legs caught them up in a few seconds. Which was not comforting. Their captors were painted dogs too, and they were better fed than Mhumhi. They whipped around the end of the row into the one beside it, going back towards the door, en masse. Mhumhi ran with Kutta and Vimbo in front of the others, heart pounding, forcing himself not to outstrip them anymore, though he could go faster… Behind them Bii and Mini ran. Mini was panting hard, her little legs working at a furious pace, and Bii ran in a low dart. On the other side of them they heard a sudden squeal- it seemed like the maned wolf had been found. Mhumhi risked a glance sideways and saw the shapes of painted dogs through the paired runs, some converging, others running straight on. The captive hulkers were getting worked up, yelling and banging on the chain-link, as noisy as the domestic dogs. They were at the end of the row when a painted dog sprang in front of them, his ears up and a bewildered look in his eyes. Mhumhi increased his speed and bowled him over easily, making him give a startled yelp. He could hear the chattering of the others- some were coming up behind them, some around from the other row. Vimbo squealed, a stream of urine splattering on the concrete as he ran. The stench was so overpowering that Mhumhi briefly stumbled. The painted dogs added more whines to their chatter, some cringing and stopping at the pungent mark, though most of them kept on. The door was right in front of them. He slammed into it, even as teeth stabbed at his flank, sprang into the cool night air. Kutta came behind him and then Vimbo bulled his way through. Mhumhi turned around and saw that a painted dog had got Mini by her back, though she was thrashing and snapping. Bii was nowhere in sight. “The door, Mhumhi!” Kutta urged. Vimbo was running in a little circle, keening. Mhumhi reared to push it shut, but there came a howled, “WAIT!” and then Mini thrust herself through. A large patch of fur was missing from her back. A second later Mhumhi and Kutta reared and used their weight to push the door firmly shut. Mhumhi let himself fall back down to all fours, panting, hardly believing it. Mhumhi said nothing for a moment, his tongue hanging far out as he panted. “No,” said Mhumhi. “No, I’m sure it will take them a very long time to even break into the warren past the gates… if they do it at all… You don’t realize how much they are underestimating the bouda. We will have time to get there and more, I think.” I hope, he added to himself. It was their only shot. They might have a slim chance of catching the dogs transporting Maha and Tareq by surprise and spiriting them away- a slim chance- but sitting where they were with the guard pack behind them was suicide. “Besides, you lot are big and strong fellows to have around,” Mini added, a touch of practicality in her tone. “Oh,” said Kutta, blinking rapidly with surprise. Mhumhi shared in it, though he also felt a bit of glee- for once, his spur-of-the-moment to help someone had resulted in a pretty useful ally. Kutta put her ears up. That was sort of a strange thing to say, thought Mhumhi, and he opened his mouth to question her further, but just then there was a thump behind the closed door. “Right,” said Kutta, springing up, and the four of them began to run again. “his spur-of-the-moment to help someone” urge to help?